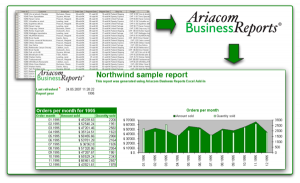 If you are looking for a free business reporting software then you can try with Ariacom Business Reports. It is a freeware for Windows. With the help of Ariacom Business Reports suite you can easily create your daily reports in different formats like PDF, HTML, XML and many other formats. Ariacom Business Reports can query any database with an ODBC driver. So you can get the reports from popular databases like MS Access, MS SQL Server, Oracle (8.x and 9.x) and MySQL. Ariacom Business Reports provides an integrated query engine, analysis tool, reporting and publishing functionalities for enterprise data. It will really improve your company productivity by providing the end user with powerful and flexible reporting. * You can directly send reports by e-mail or to FTP servers You can also print and fax them directly. * With the Report Manager Thin Client you can set up your reports from anywhere.